Well, a Merry Xmas and a Happy New Year to all my readers. Thank you for taking the time and trouble to pass-by. This blog will now - failing major and surprising new developments in the global economy - be offline till the end of the first week in January, or till after the festival of Los Reyes Magos in Spain (for those of you who know what this is all about). Come to think of it, maybe this is just what our ever hopeful central bankers are in need of even as I write - some surprise presents from the three wise men - but I fear that this year if these worthy gentlemen do somehow show at the next G7 meet, the star in the east which draws them will not be the one described in the traditional texts, but in all likelihood the rising star of India. The Russian government plans to submit amendments to the federal budget to keep its promise of increasing the wages of government employees, Prime Minister Viktor Zubkov told Russia's newly elected lawmakers today. "I especially underline the importance of passing amendments to the budget to increase the wages of government employees and military personnel," Zubkov said in a speech before the State Duma lower house of parliament in Moscow today. "We should strictly fulfill all our promises to citizens,'' he told the Duma's opening session in remarks broadcast live on state television. Higher-than-anticipated inflation this year has made it necessary to budget extra funds for salaries, he said. The Russian parliament has already approved an increase in government spending this year of about 2 percent of gross domestic product as part of the preparations for the parliamentary elections held on Dec. 2 and for the presidential vote which is due in March 2008. President Vladimir Putin, who has said he's ready to serve as prime minister beginning next May under his chosen successor, Dmitry Medvedev, said on Dec. 19 that the 2008 budget increase was essential to retain the "trust'' of the people. Now far be it from me to criticise politicians for keeping their electoral promises, but there are promises and promises here, and some promises are simply populism and demagogery, especially if they involve effectively printing money to fuel ongoing inflation. 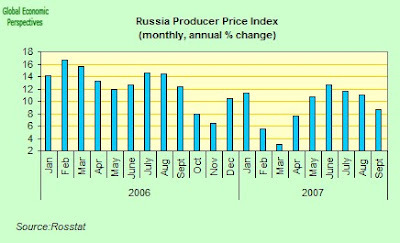 Russia's inflation rate rose to a two-year high in November, driven in part by unavoidable increases in the price of fresh fruit, vegetables and other food items, but also fueled by growing labour shortages as the 6% odd growth which the Russian economy is experiencing put pressure on a labour supply which is under great strain due to Russia's unusual demographics (a full analysis of this problem can be found in this post). The inflation rate rose to 11.5 percent in November, the highest since October 2005, up from 10.8 percent in October, and there is certainly no sign in the immediate future of all this letting up. 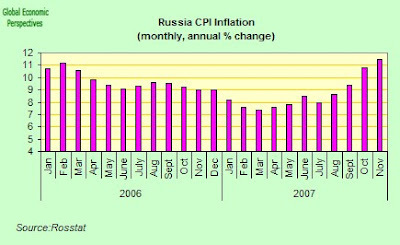 The Russian government's "massive additional spending'' this year is pushing up inflation, according to the OECD. 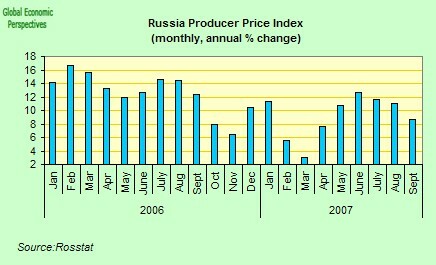 The OECD raised its forecast for Russian inflation up to 11% for this year and 9.5% for next year, from an earlier 7.5% for 2007 and 6.5% for 2008 as a result of the country's relaxed monetary conditions and tightening labor market, according to their twice-yearly economic outlook published earlier this month. addressing the underlying roots of inflation." The OECD identified private consumption and fast rising real wages together with credits to households as the main engine of growth., noting that massive net capital inflows, which aren't sterilized, and an unemployment rate that has fallen below the historic low of 6.0%, have played as big a part as food prices in boosting inflation. So today's statement by Viktor Zubkov only pours additional oil onto already troubled waters. 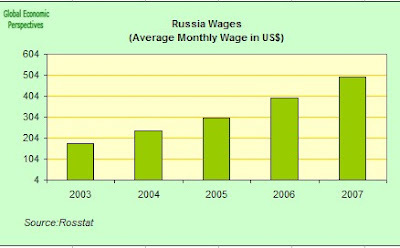 Russian wages have increased considerably in recent years, and the average monthly dollar wage (see chart below) has increased from around 175$ a month in 2003 to approxiamtely 500 dollars a month at the end of September 2007, including a 31 percent increase in the first nine months of 2007 as the rouble continued appreciating against the US dollar. The current trends suggest that the average monthly dollar wage at the end of December 2007 may exceed USD 520. According to Rosstat, average real wage and disposable income increased by 16.2 and 12.9 percent, respectively during the first nine months of the 2007 (see chart below). Increases in real wages continues to be well above growth in GDP - and evidently well above productivity growth - in most sectors of the economy. Almost all sectors of the economy are now reporting increases in nominal wages well above 20 percent during 2007. And there is no immediate end to this in sight. Conceptually we could think of Russia being about to have a very large version ofthe "Baltic problem" (the canaries down the coal mine). All you need to do is make a mental switch and replace capital inflows from oil lying under the ground for the people working out of the country in the Baltic (or Bulgarian, or Romanian, or Polish, or Ukranian) case. Both mechanisms produce a large inflows of funds, which go to work in domestic sales and construction. Since we are short of people in each case, then this surge in demand naturally squeezes up wages and then rapidly makes exports non-competitive. As a consequence the country involved becomes more and more dependent on imports. Call this the Baltic syndrome if you will, and plagiarising an old adage, we might say that once the Baltics sneeze it is the global economy which catches the cold. Amazingly, we are brought to the conclusion that if inflation continuies at this pace, and the rouble does not fall to compensate, then Russia could eventually have a trade deficit, even with all the natural resources she has in play, and at the rate we are going this point may not be too far away. What we need to bear in mind is that while global oil prices may drop back slightly (depending on whether and to what extent there is a slowdown in global growth in 2008), they are unlikely to continue to rise at the same pace as they have been (imagine a US consumer facing oil at $200 a barrel) and so since Russian oil capacity is, at best, more-or-less constant (due to depletion issues), Russia cannot continue to rely so heavily on oil exports for continuing growth (and as living standards rise oil revenues will gradually and inevitably come to consitute a declining share of GDP). And this will become doubly the case if the rouble is allowed to rise (as it must be at some point) since the roublevalue of the oil revenue will become accordingly less. Really, if you want to understand more about this very important problem, my lengthy analysis of Russia in Too Much Money Chasing Too Few People is a must read. Russia's inflation rate rose to a two-year high in November as the prices of fruit, vegetables and other food prices surged. The rate rose to 11.5 percent, the highest since October 2005, up from 10.8 percent in October, according to data released todat by the Federal Statistics Service. Economy Minister Elvira Nabiullina indicated that the Russian government anticipate that consumer prices will increase an annual 12 percent this year, compared with last year's 9 percent rate. The Russian government's ``massive additional spending'' before this years elections also helped push up inflation by stoking up additional demand the Organization for Economic Cooperation and Development said earlier this month in a report. Legislators approved additional budget outlays this year as the nation prepared to hold parliamentary elections on Dec. 2 and a presidential vote in March 2008. For a full and extensive analysis of the dynamics of Russia's growing inflation problem see this post here. 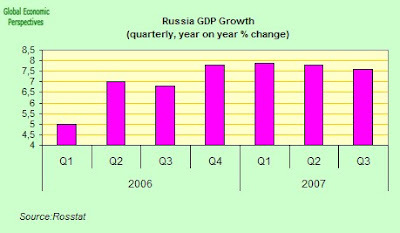 Russia's economy expanded an annual 7.6 percent in the third quarter, faster than many economists had been expecting. This followed a 7.8 percent expansion in GDP in the second quarter, the Moscow-based Federal Statistics Service Rosstat said on its Web site today. Russia, the world's biggest energy exporter, is enjoying its ninth consecutive year of economic expansion, boosted by revenue from energy sales and rising wages. The economy will expand at least 7.3 percent this year, up from 6.7 percent in 2006, according to the Economy Ministry's forecasts. 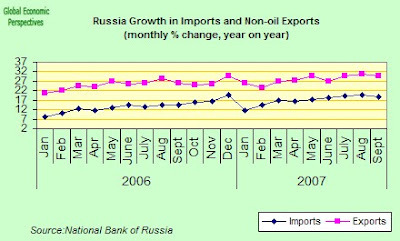 Consumer demand and fixed capital formation growth has been very strong in Russia, but net-exports have not (comparatively) been performing so well.In fact in the first half of 2006 net exports contributed minus 1.4 percentage points to GDP growth, while in the first half of 2007 the slowdown in the rate of export increase constituted an an even bigger relative drag, at minus 3.7 percentage points. So export growth has weakened during 2006/2007 and the emergence this negative contribution of net exports to GDP growth is important, since what it indicates is that while non-oil exports are growing, they are not growing as fast as imports. So it is the rapid acceleration of imports and Russia's comparatively weak non-energy export performance which have meant that the size of the trade surplus has been steadily declining (and remember that the data here are in "nominal" - money - terms, thus the decline in the real value of the surplus is more significant than it appears). Booming domestic demand has been fueling import growth, while the real appreciation of the exchange rate and rising labour costs far beyond the levels of productivity increases have been eroding competitiveness in most tradable sectors in manufacturing (outside resources and metals) in so doing raising the question of just how sustainable that Russian trade surplus actually will prove to be in the mid term. Unlike oil revenues, capital inflows have a different impact on the Russian economy for the simple reason that they are not absorbed by the Stabilization Fund (and thus effectively sterilised). Consequently they serve to drive additional money expansion and exert upward pressure on the ruble. 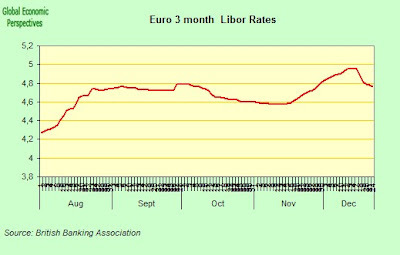 Given the limited monetary instruments available to the Russian authorities for sterilization (the bond market, eg, is very underdeveloped) and the current stance of monetary policy (which attempts to limit the pace of nominal exchange appreciation), reducing inflationary pressures is becoming an exceedingly difficult task. And if we look for a moment at the components in Russia inflation (see charts below) we will find two old friends out there in the forefront - food and construction. In fact in the first 10 months of 2007 the rate of increase in construction costs was some 15% (as compared to only 9% during the equivalent period of 2006). Food price increases are evidently a global phenomenon, but the structural basis for these increases is nonetheless important. Global growth at the present time is being driven by very rapid increases in living standards in the newly developing economies (and especially in the so-called BRICs). Now one of the stylized characteristics of these economies is that the population in general tends to be comparatively poor, and as a result food consumption tends to constitute a largish share in the consumption basket (see chart for Russian CPI weightings below, in China and Turkey, and by way of comparison, food related products constitute around 25% of the CPI basket). Total factor productivity growth in Russia has been strong in recent years (averaging 5.8 percent over the 1999 - 2005 period according to World Bank calculations), and TFP growth has been the principal driving force behind average GDP growth. In part this surge in Russian productivity can be explained by increasing utilization of excess capacity, but this is only one part of the story, and the strong performance isalso attributable to major structural shifts in the economy with the reallocation of labor and capital from less to more productive sectors. The World Bank calculates that efficiency gains within firms accounted for 30 percent of total manufacturing productivity growth over the period 2001-2004, while a more efficient allocation of resources across firms accounted for a further 24 percent. Firm turnover (entry of new firms and exit of obsolete ones) accounted for 46 percent of manufacturing productivity growth. The main contribution to manufacturing productivity growth came from the exit of obsolete firms, releasing resources that could be used more effectively by new or existing firms. So even allowing for capacity utilization issues, the World Bank found that out of the overall GDP growth of 6.5 percent achieved in Russia over the 1999-2005 period, productivity gains from employed resources accounted for 4.15 percentage points (or approximately two thirds). So Russia's economic transformation has been accompanied by a dramatic shift of resources (both capital and labour) into previously underdeveloped services areas and sectors. At the sectoral level, the shift of labor into services has spurred higher productivity in agriculture, as result of labor shedding (but note below how a rural inflation problem can arise if the labour outflow is not accompanied by a capital inflow in a supply-side constrained economy like Russia), as well as in manufacturing. Over the 1999-2003 period labor in-particular transited away from low-productive sectors (agriculture) towards more productive sectors (services). The Russian economy also continues to experience an investment boom - although levels of investment still remain comparatively low (for a developing economy) as a share of GDP, and investment is overly concentrated in a few sectors. Aggregate fixed capital investment grew by 21.2 percent in the first nine months of 2007 as compared with the 11.8 percent growth reported for the same period in 2006. While capital investments decelerated in September 2007 they still posted double-digit growth rates (16.1 percent, relative September 2006). Most manufacturing sectors of the economy, and especially those with higher value added, still receive a relatively low share of investment. For example, machine building received only 1.1 percent of the total fixed capital investment in the first half of 2007, while transport, communication and real estate operations accounted for over 35 percent of the total. This is a picture that anyone following in detail the evolution of the EU10 economies (or Ukraine for that matter) should now be pretty much familiar with. 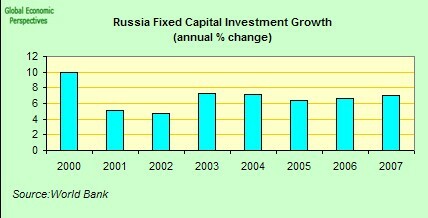 Foreign investment surged during the first half of 2007, reaching 5 percent of GDP. The Russian central bank has estimated that inward FDI reached almost 28 billion USD during the first half of 2007 (5 percent ofGDP), 10 billion more than a year earlier. Preliminary estimates show FDI inflows at USD 37 billion for the first three quarters of 2007 in the non-banking sector alone. However, FDI remains concentrated in resource extraction industries and non-tradable sectors, playing only a marginal role in manufacturing. Mineral resource extraction, metals and non-tradables sectors (particularly trade) remain the favorite directions of foreign investments. Mineral resource extraction industries received USD 11.2 billion in FDI during the first half of this year (of which USD 10.7 bln. from Netherlands. To get some idea of the scale of involvement in Russia from Dutch energy companies such as, Gas Terra, Essent and Nederlandse Gasunie see this summary of the proposal for developing the Yamal peninsula and the Kara Sea that Royal Dutch Shell's Chief Executive Officer Jeroen van der Veer was recently pitching to Vladimir Putin). These resource extraction inflows amounted to 71 percent of the total FDI inflows, compared to only 33 percent in 2006. Manufacturing industries, on the other hand, received only USD 1.8 billion, or 11.1 percent of total FDI inflows in the first half of 2007, compared to 19 percent in 2006 and over 45 percent in 2005. A comparatively warm winter last year, an increasing demand for labor in the principal economic sectors and a declining working-age population have all contributed to produce a significant and lasting reduction in unemployment. The average unemployment rate (using the ILO definition) fell to 6.3 percent in the first three quarters of the year, compared to an average of 7.3 percent registered during the corresponding period of 2006. By September 2007 the unemployment rate had decreased to 6 percent (see chart below). At first sight the downward trend we are currently observing in Russian manufacturing growth - at at time when domestic demand and construction are accelerating - seems strange. The most probable explanation is that the slowdown is associated with challenges to Russia's tradable sectors (outside resources and metals). Those parts of the manufacturing sector that service domestic demand and encounter limited competition from imports should, after all, be able to continue to thrive in the midst of Russia’s booming domestic market. But the ongoing appreciation of the ruble and the tightening we are seeing in the Russian labour market (as workers, for one reason or another, disappear from the workforce) are evidently serving to drive up unit labor costs, in a way which suggests that wages are growing much more rapidly than productivity. And without commensurate increases in productivity, real ruble appreciation and large wage rises make achieving export competitiveness in manufacturing sectors (outside resource-extraction and metals) an ever more challenging process. According to Rosstat, average real wages and disposable income increased by 16.2 and 12.9 percent, respectively during the first nine months of the year (see chart above). Increases in real wages continue to be well above the GDP growth rate - and surely the productivity growth rate - in most sectors of the economy. Almost all sectors of the economy are now reporting increases in nominal wages well above 20 percent across 2007. 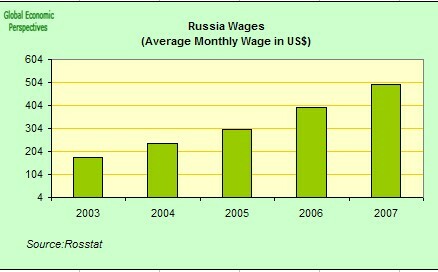 The average monthly dollar wage has been steadily increasing over the years (see chart above) and increased to 497 dollars (or by 31 percent over the same period in 2006) in the first nine months of 2007 as the rouble continued to appreciate against the US dollar. Current trends suggest that the average monthly dollar wage may exceed USD 520 by the end of this year. The Russian authorities now appear to be resigned to the idea that by year's end inflation will be running around around 11 percent (Dec-on-Dec) as compared to 9 percent for Dec-on-Dec registered in 2006. And this inflation is, of course, moving on down the line and entering industrial producer prices. 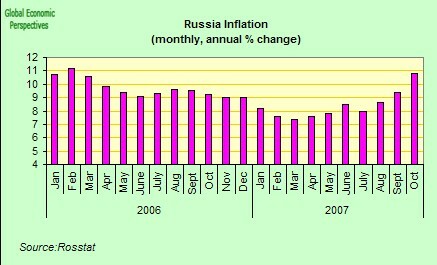 Apart from the sudden inward surge of funds which we have witnessed in the second half of 2007 (see below) the most notable monetary development in 2007 is that other surge, the inflation one, which outside and beyond Russia, we have also been witnessing across much of the EU10 as a region. At one point Russian inflation did seem to have been coming gradually under control, and remained this way into the first quarter of 2007. Since then, however, it has steadily been gaining and sustaining momentum, and the problem has only deteriorated with each new monthly reading as the year has advanced. In fact inflation reached a cumulative total of 9.3 percent over the first ten months of 2007, with the rate accelerating to 10.8 percent in October, the highest level recorded since February 2006. This was up from the 9.4 percent registered in September and a month on month increase of 1.6 percent. Thus given that Russia in now an economy which may be considered (after years of taking up outstanding capacity slack, see more below) to be an economy which is growing close to potential, benefiting in part from high energy prices and large capital inflows. In this situation Russia faces two main challenges: inflationary pressures and an overly rapid appreciation of the exchange rate. Both of these represent serious problems in the Russian case since they are liable to produce a steady turn around in the trade balance and expose a Russian economy dependent on an inward flow of funds to the vagaries of world energy prices and the risk appetite of overseas investors. 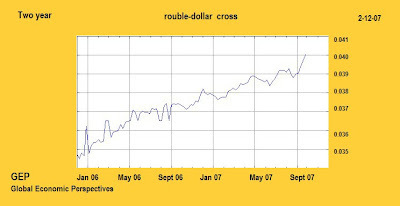 As can be seen in the chart, the value of the rouble has been rising slowly but steadily over the last couple of years, the big problem which could face the Russian authorities would be if any move to ease currency management procedures were to lead to a large and rapid appreciation in the rouble, and if this were then to be associated with an equally sudden inward surge of funds, funds which would in all probability generate a further surge in domestic demand, domestic demand which, given the critical state of Russia's workforce and labour market, could not be met internally, and hence my cryptic adaptation of the standard inflation definition in the title of this post, since what we would actually have would be too much money chasing too few people. Meanwhile those sectors servicing the domestic market (such as construction and the retail trade) continued to boom. The highest rates of output growth were reported in construction (23.5 percent) and the retail trade (15 percent) The rate of aggregate output growth of the base industries and sectors (often used as a proxy for GDP growth) amounted to 8.6 percent in the first nine months of 2007 compared to only 5.7 percent in the corresponding period of 2006. The emergence of this negative contribution of net exports to GDP growth is important, and is largely explained by rapid acceleration of imports and Russia's weak non-energy export performance which have meant that the size of the trade surplus has been steadily declining. Booming domestic demand has been fuelling import growth, while the real appreciation of the exchange rate and rising labour costs far beyond the levels of productivity increases have been eroding competitiveness in most tradable sectors in manufacturing (outside resources and metals) in so doing raising the question of just how sustainable that Russian trade surplus actually will prove to be in the mid term. Latest Rosstat estimates indicate that industrial growth, and in particularly, manufacturing growth, slowed in the third quarter of the year. Industrial production in August and September grew by only 3.0 and 3.8 respectively, as compared to 4.1 and 5.6 percent reported for the same months a year earlier. Similarly, preliminary statistics for August and September already show manufacturing growth of only 5.5 and 4.0 percent respectively, compared to 6.2 and 5.1 percent last year. Four out of thirteen manufacturing industries reported negative growth rates in August and five in September, compared to only two last year. Just four manufacturing industries reported higher growth rates in August and September 2007 than during corresponding months of last year. The same sort of notable slowdown was also reported for extraction industries. 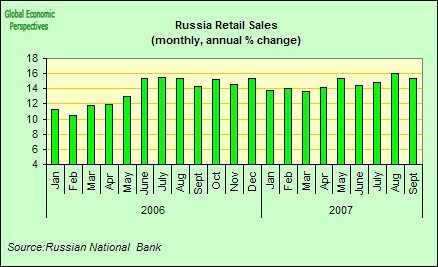 Meanwhile Mother Russia trundles on, and the economic performance has been and remains robust. Having grown by 7.9 percent (year on year) in the first half of 2007 (as compared with 6.7% y-o-y in H1 2006), Russia is more than likely to post full-year GDP growth of over 7 percent in 2007 despite some recent slowing down (of which more below). This growth in output continues to be driven - following a pattern which we are observing across central and eastern Europe - by buoyant household consumption and booming construction activity. Domestic consumption in fact increased by 9.8 percent in the first half of 2007, contributing in the process about 6.7 percentage point to the half yearly GDP growth. Manufacturing growth has been solid in recent years, but, as we will see, it has actually started slowing notably in the second half of 2007. Inflation in Russia: Too Much Money Chasing Too Few People? 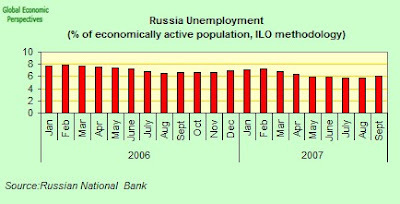 Over the next few years Russia is almost certainly going to face a serious crisis in its labor markets. According to data from the Russian Health and Social Development Ministry, by 2010, the country's workforce is projected to fall by almost 9 million (assuming participation rates remain unchanged, for which see below), from the presnt 74.5 million to the reduced figure of 65.5 million. This scenario sounds becomes even more preoccupying when we begin to think about the fact that Russia is already losing over 700,000 working-age people every year, due to a lethal combination of high mortality and low birth rates. The low fertility is almost normal and commonplace among the ECA (Europe and Central Asia) countries but the high levels of adult mortality at relatively young ages are more or less unique to Ukraine and the CIS countries, and the persistance of this phenomenon raises very important question, only some of which are economic ones. 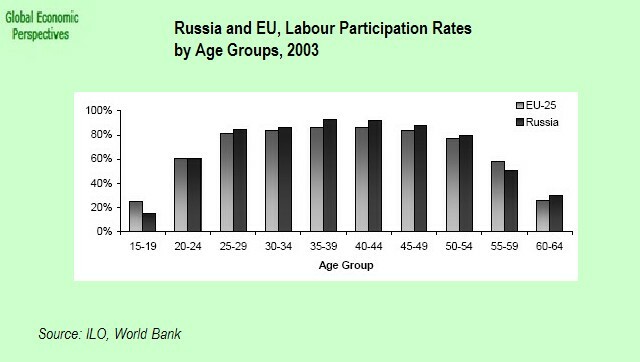 And the problem only begins to get worse when we begin to think about the low relatively level of labor mobility and labor flexibility which exists in Russia, the relatively low-level work ethic which exists in some parts of the country, and the poor quality of a large part of the employee vocational and training systems.The labor market development plan for 2007-10, presented recently by Health and Social Development Minister Mikhail Zurabov, is supposed to be an attempt to begin to address the huge chalange this situation represents, but even given the best of intentions and the ability to act decisively (both of which are things which should not by any means be automatically assumed in the world of contemporary Russoa, the plan at the very best, can only be described as a declaration of intent, and meanwhile Russia's labor market problems remain, and in the best of cases could be describe as being in a state of organised chaos. Meanwhile Mother Russia trundles on, and economic performance has been and remains robust. 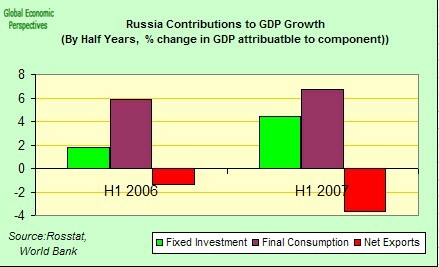 Having grown by 7.9 percent (year on year) in the first half of 2007 (as compared with 6.7% y-o-y in H1 2006), Russia is more than likely to post full-year GDP growth of over 7 percent in 2007 despite some recent slowing down (of which more below). This growth in output continues to be driven - following a pattern which we are observing across central and eastern Europe by buoyant household consumption and booming construction activity. Domestic consumption in fact increased by 9.8 percent in the first half of 2007, contributing in the process about 6.7 percentage point to GDP growth. Manufacturing growth has been solid over the last years, but, as we will see, is actually slowing notably in the second half of 2007. Gross capital formation also continues to expand at a brisk pace - growing by 28.5 percent y-o-y during the first half of 2007 (11.2 percent in H1-2006), and in the porcess contributing 4.4 percentage points to aggregate growth, as compared with only 1.8 percentage points during the first half of 2006. The negative contribution of net exports to GDP growth is important, and is largely explained by rapid acceleration of imports and Russia's weak non-energy export performance which have meant that the importance of the trade surplus has been steadily declining. Booming domestic demand has been fuelling import growth, while the real appreciation of the exchange rate and rising labour costs far beyond the levels of productivity increases have been eroding competitiveness in most tradable sectors in manufacturing (outside resources and metals) in so doing raising the question of just how sustainable that Russian trade surplus actually will prove to be in the mid term. Meanwhile those sectors servicing the domestic market (such as construction and the retail trade) continued to boom. 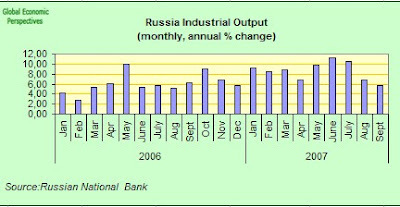 The highest rates of output growth were reported in these two sectors: construction (23.5 percent) and retail trade (15 percent) The rate of aggregate output growth of the base industries and sectors (often used as a proxy for GDP growth) amounted to 8.6 percent in the first nine months of 2007 compared to only 5.7 percent in the corresponding period of 2006. Thus given that Russia in now an economy which may be considered (after years of taking up outstanding capacity slack, see below) to be an economy which is growing close to potential, benefiting in part from high energy prices and large capital inflows. In this situation Russia faces two main challenges: inflationary pressures and an overly rapid appreciation of the exchange rate. The former and the latter would represent problems since they will steadily turn round the trade balance and expose a Russian economy dependent on an inward flow of funds to the vagaries of world energy prices and the risk appetite of overseas investors. As can be seen in the chart, the value of the rouble has been rising slowly but steadily over the last couple of years, the big problem which could face the Russian authorities would be if any move to ease the currency regulation process lead to a large and rapid appreciation which produced an equally sudden inward surge of funds, funds which would generate domestic demand, a demand which, given the critical state of Russia's workforce and labour market, could not be met internally, hence my cryptic adaptation of the standard inflation definition in the title of this post, since what we would actually have would be too much money chasing too few people. 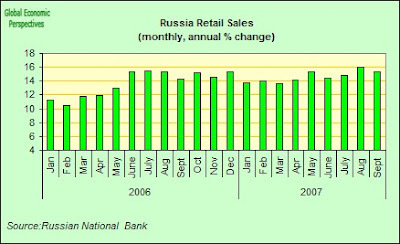 Apart from the sudden inward surge of funds which we have witnessed in the second half of 2007 (see below) the most notable monetary development in 2007 is that other surge, the inflation one which outside Russia we have been witnessing across much of the EU10 region. As we have noted elsewhere, while appear pacified, and remained reasonably under control in the first quarter of 2007, it has steadily managed to gain and sustain momentum as the year has advanced. In fact inflation reached a cumulative total of 9.3 percent over the first ten months of 2007, with the rate accelerating to 10.8 percent in October, the highest level recorded since February 2006. This was up from the 9.4 percent registered in September and a month on month increase of 1.6 percent. The Russian authorities now accept that by the end of the year inflation will be running around 11 percent (Dec/Dec) as compared to 9 percent for Dec/Dec in 2006. And this inflation is, of course, moving on down the line and entering industrial producer prices. At first sight this downward trend in Russian manufacturing growth at at time when domestic demand and construction are accelerating could be thought to be associated with challenges presenting themselves in Russia's tradable sectors (outside resources and metals). Those parts of the manufacturing sector that service domestic demand and encounter limited competition from imports could, after all, continue to thrive in Russia’s booming domestic market. But the real appreciation of the ruble and the tightening which is taking place in the Russian labour market, as workers, for one reason or another, disappear from the workforce, are evidently serving to drive up unit labor costs, in a way which clearly indicates that wages are growing more rapidly than productivity. Without commensurate increases in productivity, real ruble appreciation makes achieving export competitiveness in manufacturing sectors (outside resource-extraction and metals) an ever more challenging process. According to Rosstat, average real wage and disposable income increased by 16.2 and 12.9 percent, respectively during the first nine months of the year (see chart above). Increases in real wages continues to be well above growth in GDP - and most likely the productivity growth - in most sectors of the economy. Almost all sectors of the economy are now reporting increases in nominal wages well above 20 percent during 2007. 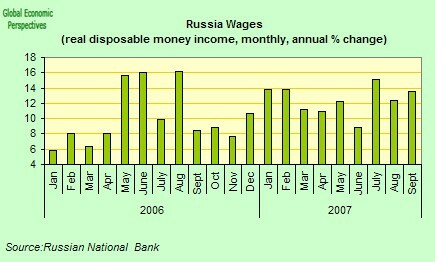 The average monthly dollar wage has been steadily increasing over the years (see chart above) and increased to 497 dollars (or by 31 percent) in the first nine months of 2007 as the rouble continued appreciating against the US dollar. The current trends suggest that the average monthly dollar wage in 2007 may exceed USD 520. A comparatively warm winter, an increasing demand for labor in the majority sectors of the economy and a declining working age population have all positively contributed to produce a significant reduction in unemployment. The average unemployment rate (using the ILO definition) fell to 6.3 percent in the first three quarters of the year, compared to an average of 7.3 percent registered during the corresponding period of 2006. By September 2007 the unemployment rate had decreased to 6 percent (see chart below). This follwing section is largely based on the results of an analysis for a forthcoming World Bank study entitled “Unleashing Prosperity: Productivity Growth in Eastern Europe and the former Soviet Union”, which is summarised in the latest WB report on the Russian Federation (see references below). Total factor productivity growth has been strong (averaging 5.8 percent over the 1999 - 2005 period according to the World Bank calculation), and has been the principal driving force behind average GDP growth. In part the Russian productivity surge is explained by increasing utilization of excess capacity, but it is also attributable to major structural shifts in the economy and the reallocation of labor and capital from less to more productive sectors. The World Bank calculates that efficiency gains within firms accounted for 30 percent of total manufacturing productivity growth over the period 2001-2004, while a more efficient allocation of resources across firms accounted from 24 percent. Firm turnover (entry of new firms and exit of obsolete ones) accounted for 46 percent of manufacturing productivity growth. The main contribution to manufacturing productivity growth came from the exit of obsolete firms, releasing resources that could be used more effectively by new or existing firms. 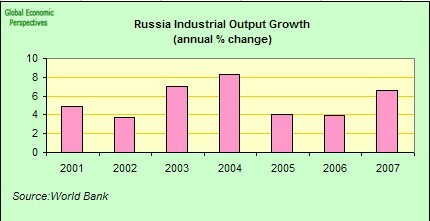 So even allowing for capacity utilisation issues, the World Bank found that out of an overall growth of 6.5 percent in Russia during 1999-2005, productivity gains from employed resources accounted for 4.15 percentage points of the 6.5 percentage points overall growth (or approximately two thirds) in the Russian economy in the years between 1999-2005. The economic transformation of Russia has been accompanied by a dramatic shift of resources (both capital and labour) into the previously underdeveloped services sectors. At the sectoral level, the shift of labor into services has spurred higher productivity in agriculture, as result of labor shedding (but note below the rural inflation problem this can present if the labour outflow is not accompanied by a capital inflow in a supply-side constrained economy like Russia), as well as in manufacturing. Over the 1999-2003 period labor in particular transited away from low-productive sectors (agriculture) towards more productive sectors (services). The Russian economy also continues to experience an investment boom - although levels of investment still remain comparatively low relative to GDP, and are overly concentrated in a few sectors. Aggregate fixed capital investment grew by 21.2 percent in the first nine months of 2007 as compared with 11.8 percent growth reported for the same period in 2006. While capital investments decelerated in September 2007 they still posted double-digit growth rates (16.1 percent, relative September 2006). Most manufacturing sectors of the economy, and especially those with higher value added, still receive a relatively low share of investment. For example, machine building received only 1.1 percent of the total fixed capital investment in the first half of 2007, while transport, communication and real estate operations accounted for over 35 percent of the total. This is a picture that anyone following in detail the evolution of the EU10 economies (or Ukraine for that matter) should now be pretty much familiar with. Foreign investment surged during the first half of 2007, reaching 5 percent of GDP. The Russian central bank have estimated that inward FDI reached almost 28 billion USD during the first half of 2007 (5 percent ofGDP), 10 billion more than a year earlier. Preliminary estimates show FDI inflows at USD 37 billion for the first three quarters of 2007 in the non-banking sector alone. However, FDI remains concentrated in resource extraction industries and non-tradable sectors, playing only a marginal role in manufacturing. Mineral resource extraction, metals and non-tradables sectors (particularly trade) remain the favorite directions of foreign investments. Mineral resource extraction industries received USD 11.2 billion in FDI during the first half of this year (of which USD 10.7 bln. from Netherlands, to get some idea of the scale of involvement in Russia from Dutch energy companies such as, Gas Terra, Essent and Nederlandse Gasunie see this summary of the proposal for developing the Yamal peninsula and the Kara Sea that Royal Dutch Shell's Chief Executive Officer Jeroen van der Veer was recently pitching to Vladimir Putin), amounting to 71 percent of the total FDI inflows, compared to only 33 percent in 2006. Manufacturing industries, on the other hand, received only USD 1.8 billion, or 11.1 percent of total FDI inflows in the first half of 2007, compared to 19 percent in 2006 and over 45 percent in 2005. However, unlike oil revenues, capital inflows are not absorbed by the Stabilization Fund, and consequently serve to drive additional money expansion and exert upward pressure on the ruble. Given the limited monetary instruments for which are available for sterilization and the current stance of monetary policy (which attempts to limit the pace of nominal exchange appreciation), reducing inflationary pressures is becoming an exceedingly difficult task. And if we look for a moment at the components in Russia inflation (see charts below) we will find two old friends out there in the forefront - food and construction. In fact in the first 10 months of 2007 the rate of increase in construction costs was some 15% (as compared to only 9% during the equivalent period of 2006). Food price increases are evidently a global phenomenon, but the structural basis for these increases is nonetheless important. Global growth at the present time is being driven by very rapid increases in living standards in the newly developing economies (and especially in the so-called BRICs). Now one of the characteristics of these economies is that the population in general tends to be comparatively poor, and as a result food consumption tends to constitute a largish share in the consumption basket (see chart for Russian CPI weightings below, in China and Turkey, by way of comparison food related products constitute around 25% of the CPI basket). Now to some extent Russia's manpower shortages mean that supply in the agriculture sector is somewhat constrained, while technological improvement if investment totals are anything to go by is not notably accelerating. Investment in transport and communication was 23.31% of total investment in the first half of 2007, and in real estate it was 12%, while in agriculture it was only 4.7%. FDI in agriculture only constituted 0.7% of the total during the same period. Labour productivity in Russian agriculture only grew by 4.4% per annum over the 1999 - 2004 period (the lowest for any sector, World Bank calculations), and thus starved of its workforce, and lacking the necessary capital investment to compensate, Russian agriculture is bound to struggle to meet the needs of an ever more affluent urban population. Basically this means either continuing inflation or growing food imports, but since global food prices are themselves rising this would need to be accompanied by sustained rouble appreciation if it were to contribute to reducing the internal price pressure. 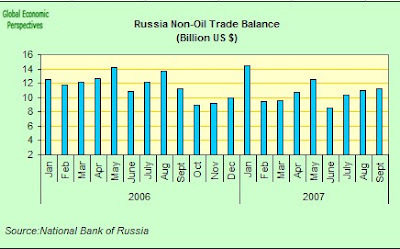 Of course this weakening in Russia’s current account position in 2007 has been more than compensated for by a strengthening of the capital account side . 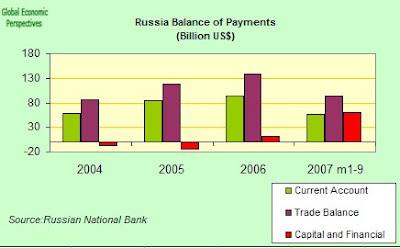 According to preliminary estimates from the Russian National Bank, the capital account showed a net surplus of USD 59.5 billion in the first three quarters of 2007, compared to a deficit of USD 5.1 billion in the same period of 2006. The surge in capital inflows pushed the balance of payments surplus to record highs and exerted new upward pressures on the ruble. The pace of reserve accumulation has increased further in 2007. Gross foreign reserves of the Central Bank have reached USD 447 billion by the end of October 2007 (35.9 percent of GDP). Capital inflows are becoming and important source of foreign reserve accumulation, exerting upward pressures on the ruble and driving money expansion. These large capital inflows reflect acceleration in foreign borrowing by state corporations and the banking sector. Net capital inflows to the private sector amounted to 56.8 billion in the first nine months of this year, compared to USD 26.3 billion in the same period of 2006. The banking sector has been the main recipient of these inflows (USD 37.6 billion net) most of which came during the second quarter of 2007. In a development which mirrors what we have been seeing across the whole of Central and Eastern Europe Russian commercial banks have been borrowing substantial funds abroad to finance domestic credit operations. Net capital inflows to the non-banking sector have also increased substantially during the first three quarters, amounting to USD 19.2 billion. According to the latest BoP estimates, the liabilities of the corporate and banking sector increased by almost USD 150 billion during the first nine months of 2007, out of which USD 55 billion represented short-term foreign borrowing. The substantial external funding of the banking sector is driving up Russia’s external debt. In June 2007 external debt reached USD 385 billion. Latest estimates suggest that in October 2007 Russia experienced a net inflow of capital of about USD 10 billion. As a result, foreign reserves increased by over USD 21.6 billion reaching USD 447 billion by end October. In the context of such large capital inflows and with limited monetary instruments to sterilize them inflation is thus becoming a huge headache. This year's strong growth in balance of payment inflows was not primarily due to higher oil prices but rather to capital inflows, and these, as I have already indicated, are not absorbed by the Stabilization Fund. The sterilization of capital inflows through general policy measures is difficult, due to the small size of the Russian bond market and limited scope for further increases in bank reserve requirements or interest rates in a liquidity-constrained financial sector. According to the World Bank the Stabilization Fund continues to act as an effective automatic stabilizer of large inflows stemming from oil revenues, but remains ineffective in the face of the capital inflows which have become an increasingly important source of reserve accumulation and money supply expansion in 2007. One obvious policy response would be to allow a more rapid nominal appreciation of the ruble, but such an appreciation presents potential risks, and especially in the context of Russia's very tightly constrained labour supply situation, since expectations of rapid nominal appreciation could potentially attract even more capital inflows. Another potential policy tool is the fiscal one, running ever larger fiscal surpluses in an attempt to drain domestic demand from the system, however recent revisions to the 2007 federal budget envisage not tightening but rather additional fiscal relaxation. The government recently submitted to the Duma a draft amendment to the 2007 Budget Law that substantially expands public expenditures for the remainder of the year. The proposed amendments envisage an increase in non-interest expenditure by 1068 billion rubles and total expenditures to 20.35 percent of GDP, compared to 17.5 previously approved. This would bring the 2007 budgetary surplus down to 2.8% of GDP from a previously projected 4.8%. In an economy that is growing at close to potential driven by booming private domestic demand, additional fiscal stimulus is only going to either increase pressures for nominal appreciation (and import dependence) or produced upward pressure on the inflation level. As we have seen above, rapid productivity gains were fairly easy to achieve in the first years following the crisis of the late 1990s, but the future is never an exact repeat of the past, and sustaining these rates of productivity growth in the future will become ever more challenging. The World Bank estimates that Russian firms have by now largely exhausted the post-crisis productivity gains derived from utilization of idle capacity and labor shedding. For several years, firms were able to raise productivity quickly with little substantive investment, by drawing on the existing underemployed stock of capital and labor. However, capacity utilization rates have now risen from the 42 percent low of 1999 to almost 70 percent in 2005. Productivity gains which far outstripped wage growth in the first years of economic recovery, are now themselves being outstripped by the rapid wage rises of the last 18 months. The real effective exchange rate has gradually returned to its pre-crisis level, and Russian firms operating in non-energy sectors are increasingly having to cope with the impact of foreign competition. The small role of capital stock accumulation and employment growth in Russia’s growth performance (see below) contrasts with the experience of other fast-growing economies in East Asia where factor accumulation is the main driver of output growth. 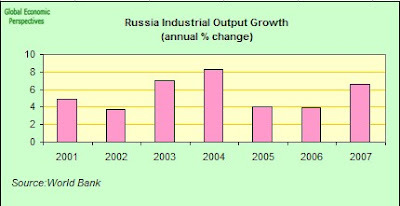 In Russia, output per capita grew by 6 percent over the period 1999 to 2004 driven largely by labor productivity growth, which accounts for two-thirds of output per capita growth (4 percentage points). The low level of additional growth attributable to increased labour inputs is, of course, a by-product of Russian demographics, and this is a problem with no easy solution. 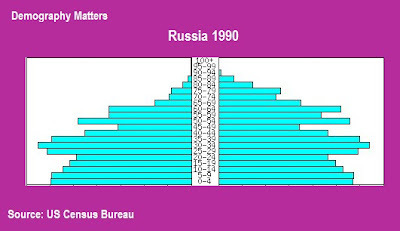 But to the decline in absolute numbers and the aging of the labor force, must be added the deficiencies which are to be found in the Russian higher education system, which only serve to worsen skill mismatches, and rigidities in labour market regulations, which make it difficult for firms to hire workers and slow the pace of reallocation of workers. As mentioned above, as well as being in absolute decline Russia’s labor force is also aging rapidly. 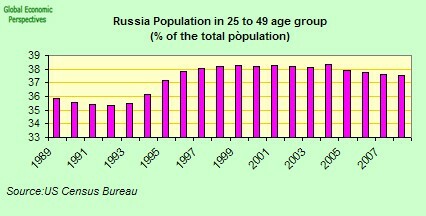 Russia’s working-age population is shifting from the younger age groups (15-39 years) to the older ones (40-64 years). Of the projected decline of 11 million in the working-age population, over 95 percent of the decrease will come from a decline in the 15-39 age group while less than 5 percent will come from a reduction in 40-64 age group. Of particular importance is the fact that the 25 to 49 age group has now finally peaked, since this age group is of special importance for economic growth for a whole series of reasons. This ageing workforce component is likely to have a further negative effect on both labour supply and labour productivity. Normally policies to address population "greying" focus on increasing participation rates increase for workers in the latter stages of the conventional “working age” and on raising the retirement age upwards towards the 70 mark. But in the Russian context such policies face particular difficulties. 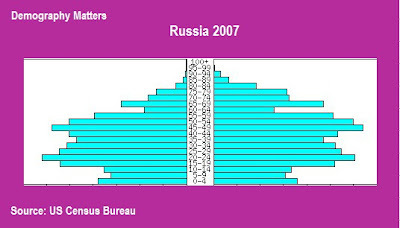 In the first place participation rates are already high in Russia by international comparisons (see chart below), and, of course, with male life expectancy in Russia still hovering around the 60 mark (see chart at the start of the post) it is hard to see how much juice there is to be actually squeezed from the 60-70 age group part of this particular lemon. 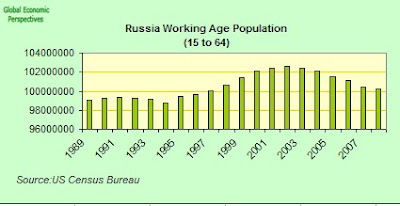 An aging labour force is also particularly challenging in Russia because wages do not follow the normal pattern of rising with age, and this would suggest that the skill and human capital composition of the older cohorts of workers is not particularly high (and remember it is this group which is now about to shoulder a growing part of the burden of carrying the Russian economy). 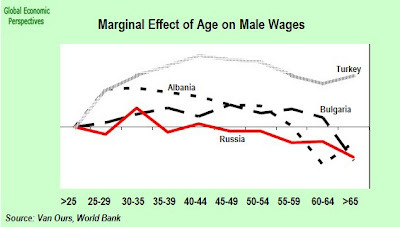 The following chart - prepared by the World Bank - shows the marginal effects of age on the wages of male workers, controlling for other wage determinants. 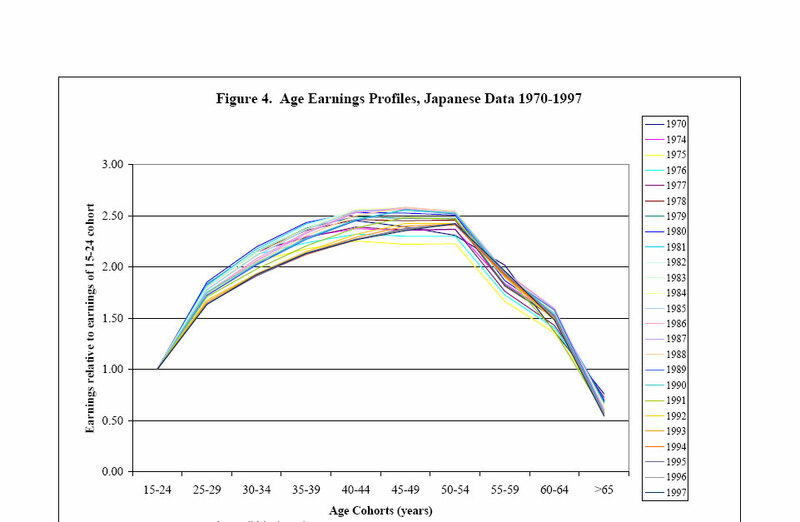 Typically, wages tend to increase with age until the late stages of working life, and in the chart above it can be seen that Turkey's profile here is much nearer to the conventional one, quite simply because Turkey's demographic and development profile is also much nearer to the conventional one (for a better comparison I am including a standard chart for Japan, showing the interesting phenomenon that these earning profiles have in fact not changed much even while the Japanese population has aged, which again should constitute a productivity warning signal for Russia). Indeed numerous studies have established and confirmed these hump shaped age-earnings profiles, attributed primarily to the long-term worker-firm relationships and/or premiums paid to those with more experience. The fact that such a pattern is not to be found in Russia (and it seems in other countries in the old Soviet Bloc), should be sending us all sorts of early warning signals which need to be acted on. In this context I cannot help finding the tone of the World Bank analysis, with its "worry not, all will be well if you only manage to increase participation" - quoted a length below - unduly complacent under the circumstances. Participation is - as we have seen - already high, and having increased participation it is not clear how employing more very low human capital workers is going to drive the productivity revolution which is needed to sustain GDP growth in the context of a declining workforce. The numbers just don't add up. The circle doesn't square. Improving labor force participation, particularly of older cohorts. Given the already high labor force participation rates, Russia has limited scope to increase labor force participation to compensate for a declining working-age population. Nonetheless, achieving higher labor force participation for older workers could contribute to offset the expected decline of the labor force. Gradually increasing labor force participation of workers aged 60 to 64, so that the rate is 10 percent higher in 2020 than in 2005 would reduce the projected decline the labor force from the 11 million to 5 million (See Figure 8).3 Increasing labor force participation rates would imply retaining older workers and reintegrating those who have left the labor market by: (i) raising the comparatively low retirement age (60 for men; 55 for women) to the OECD standard 65 for both sexes; (ii) providing life-long learning opportunities to keep skills up-to-date and retrain older workers laid off during enterprise restructuring; (iii) enabling greater flexibility in permitting part-time work; (iv) increasing educational opportunities and encourage higher education for younger Russian to improve labor force participation among the 50-64 cohort in future generations (those with higher education are 2-3 times more likely to stay in the workforce). 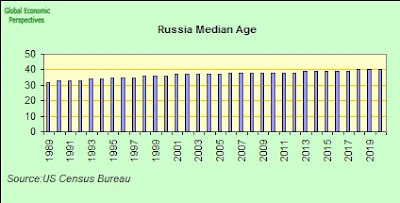 Labor supply will be negatively affected by these demographic trends: Russia’s working-age population will decline by 10 percent (about 11 million people) over the next two decades. This decline in working-age population is compounded by aging within the working-age population. The working age population (15 to 64 years) as share of total population is projected to decline by 3 percentage points (from 71% to 68%) by 2020. This represents a decline of 10 percent in the working age population, or about 11 million people. The projected decline in working-age population represents a source of concern, given that labor supply is a key determinant of economic growth. Of course inward migration could certainly help mitigate Russia’s projected labor shortage. Russia is already experiencing large migrant inflows, mostly from lower income CIS countries, whose working age population is still growing rapidly (such as the Central Asian countries). As Russia’s population continues to decline, inward migration could help ease some pressures on the labor supply. Assuming that the labor force participation rate does not increase, Russia would need over 2.8 million in-migrants by 2020 to maintain the current ratio of labor force to total population constant. Conclusions, Is Fertility a Dirty Word? As we have seen througout this extensive post developments in Russsia pose acute and quite specific problems for contemporary macroeconomic theory. A declining and ageing workforce, with low accumlated levels of human capital, accompanied by rapid "catch up" growth, large external fund inflows and pressures for currency appreciation all marry together to make for an extremely combustible mixture. The standard World-Bank-type)solution (and it has to be said here that the best analysis and coverage on what is happening in Russia comes consistently from the World Bank economists, despite the shortcomings) to increase labour force participation rates among the 55to 60 and esecially 60 to 65 age groups seems to fall far short of what is needed here. Unless what we are talking about is a pythagorian-type celestial participation of communing souls it is hard to see what exactly they have in mind here, given that the physical "earthly" presence of the Russian male over 60 is extremely limited at this point (well the Russian religion is very mystical, so maybe rather than Vladimir Putin what they need is Andrei Rublev, which Andrei Tarkovsky perhaps doing the scenification). 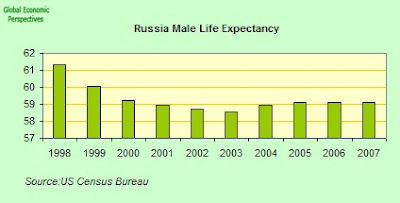 As a matter of urgent priority Russia obviously needs to have a coherent immigration policy (with some strategic thinking about what exactly to do with all the Chinese nationals who are rapidly accumulating out East for example) and it also urgently needs to address the life expectancy/health problem. Longer term the whole situation though is absolutely unsustainable unless something is done to redress the fertility deficiency, but strangely all the economic reports remain silent on this topic. Why is this, I wonder? Of course, in order to do all these things Russia also needs to address its political problems. Conceptually we could think of Russia being about to have a very large version ofthe "Baltic problem". All you need to do is make a mental switch and replace capital inflows from oil lying under the ground for the people working out of the country in the Baltic (or Bulgarian, or Romanian, or Polish, or Ukranian) case. Both mechanisms produce a large inflows of funds, which go to work in domestic sales and construction. Since we are short of people in each case, then this surge in demand naturally squeezes up wages and then rapidly makes exports non-competitive. As a consequence the country involved becomes more and more dependent on imports. Amazingly, we are brought to the conclusion that Russia could eventually have a trade deficit, even with all the natural resources she has in play, and at the rate we are going this point may not be too far away. What we need to bear in mind is that while global oil prices may drop back slightly (depending on whether and to what extent there is a slowdown in global growth in 2008), they are unlikely to continue to rise at the same pace as they have been (imagine a US consumer facing oil at $200 a barrel) and so since Russian oil capacity is, at best, more-or-less constant (due to depletion issues), Russia cannot continue to rely so heavily on oil exports for continuing growth (and as living standards rise oil revenues will gradually and inevitably come to consitute a declining share of GDP). And this will become doubly the case if the rouble is allowed to rise (as it must be at some point) since the roublevalue of the oil revenue will become accordingly less. Following a precedent established in my recent Croatia post, I am including the substantive demographic data on Russia as an appendix, in a way which means that it "informs" the economic analysis (in the sense that it is ever present, and should be ever present in our minds) without occupying the centre stage. The demographic backdrop forms the context within which day-to-day policy needs to operate. Here, then, is a collection of population data, which illustrate how the structure of the Russian population is in the process of undergoing profound change in the years between 1990 and 2020. Firstly we have the median age data. 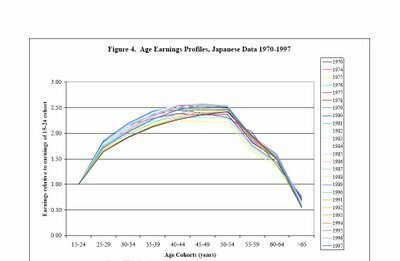 Claus and I tend to use median age data for a convenient proxy for a variety of economic phenomenon, such as saving and consumption patterns, construction activity, gross fixed capital formation, export dependence, productivity of the workforce as a collective etc. 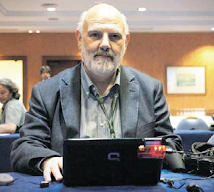 This is still all rather controversial, but one of the purposes of this blog is to test out these connections in real time as the global economy unfolds. As we can see the median age is steadily rising, and is currently in the process of crossing what Claus and I consider to be the critical 40 threshold. 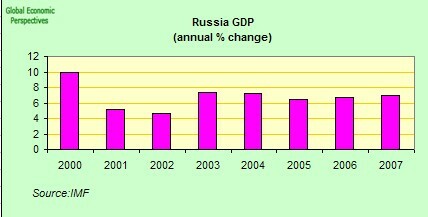 This means that, ceteris paribus, the structural characteristics of the Russian economy will almost certainly change in the coming years, with a decline in construction and an ever more pronounced export dependence, something which is going to be difficult to realise given the relative currency and output prices which are emerging, and remember, as GDP and living standards grow the energy sector share in the total economy will naturally decline. 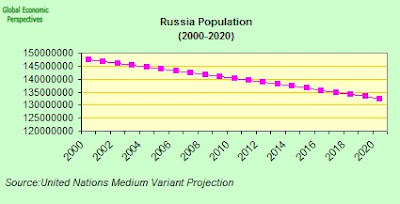 Turning now to total population, Russia’s population is expected to shrink by 12 percent (over 17 million people) between 2000 and 2025, according to UN Population projections. This is the largest drop in the Europe and Central Asia region in absolute terms and the six largest in relative terms. There are basically three drivers of median age and population ageing - fertility, life expectancy and migration. Here we can see how Russia's fertility problem is a very long term one. Essentially fertility went below replacement level during the 1970s, rebounded briefly early and mid 1980's, only to drop back again and acheive the lowest-low fertility rate which currently prevails in 1994. Whether or not fertility is able to make a comeback from such a point is a question demographer Wolfgang Lutz has been asking himself for some time now. 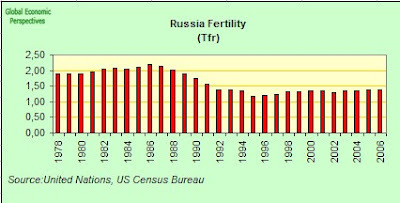 Will Russia ever re-attain near replacement fertility, or is it now caught in a more or less permanent low fertility trap? 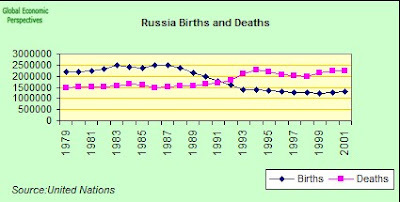 Obviously, the combination of high deaths rates and low birth rates makes for the sort of population decline we are now seeing in Russia, and - as can be seen in the next chart - the crossover in Russia's case occured around 1992. As we saw at the start of this post, Russian life male expectancy is low, and has been falling. 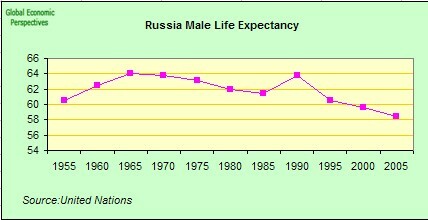 Here is a chart which gives a detailed close up of the evolution of Russian life male expectancy since the start of this century. Finally, I present three population pyramids for Russia, which give some quick impression of the evolving structural shifts in the age groups. The first pyramid, which comes from 1991, has a structure which is not at all unfavourable to rapid economic growth of the kind Russia is now having. Russia's misfortune is that it is trying to have this growth now, and not back then, when, as can be seen in the second (2007) pyramid the population is already begining to eneter a seriously unstable dynamic. 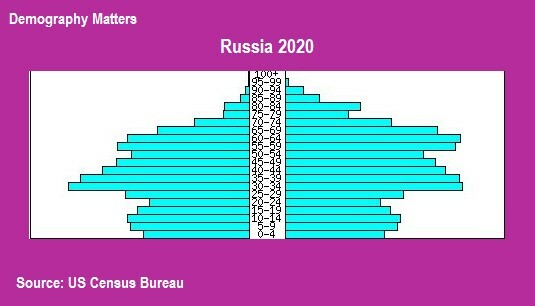 The final pyramid which is an estimate based on the UN median estimate of population development gives some idea, possibly a rather optimistic one, of what Russia's population will could like come 2020, everything here depends on the evolution of fertility, life expectancy and migration. Basically I have no hestitation in saying that I find it very hard to see how a population with such an structure distribution is going to achieve any economic growth at all. World Bank Russian Federation Economic Reports, especially the latest report (number 15, November 2007, pdf file and power point presentation). World Bank and World Health Organization Raise The Alarm On Noncommunicable Diseases And Injuries In CIS Countries, details of a high-level international conference, held in Moscow, Russian Federation on 30–31 October 2007. 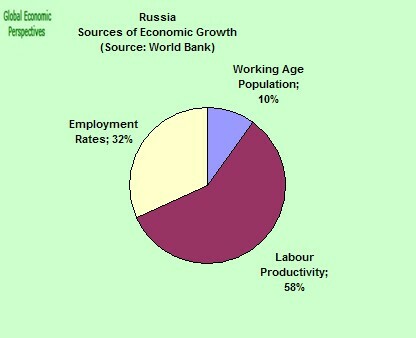 World Bank, Dying Too Young in the Russian Federation, December 2005. 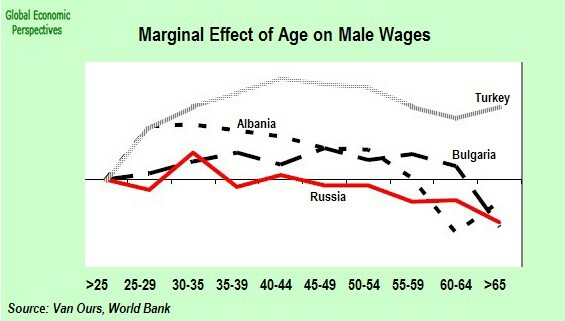 World Bank, From Red to Grey, The "third Transition" of Aging Populations in Eastern Europe and the Former Soviet Union. June 2007. 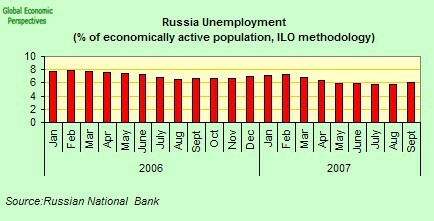 IMF, Russian Federation: Selected Issues, October 23, 2007. Four Surprises in Global Demography, By Nicholas Eberstadt, US Foreign Policy Research Institute, July 2004. Siberia: Russia's Economic Heartland and Daunting Dilemma by Fiona Hill. Brookins Insutitute, 2004. Center for Economic and Financial Research at New Economic School. 2006.
by Sergei Pirozhkov and Gaiane Safarova. Working Paper.